For as many models as possible, Wemoto stocks everything you need to maintain your forks. From the fork tubes (stanchions) themselves, springs, bushes,seals and oil, to universal fork gaitors and protectors to keep them in good shape. We also have training DVDs to show you how to replace your fork oil and seals, as well as fork drivers and other tools to fit new seals without damaging them. A damaged, bent or pitted fork tube or perished or cracked fork seal can result in an MOT failure. Paolo Tarozzi replacement fork tubes are made in Italy to the same spec as the original equipment stanchions, and with a hard chrome finish. Replacing old bent forks with aftermarket Tarozzi forks is often cheaper than straightening the originals. For some models, Tarozzi fork tubes are available with a speciality coloured coating in gold, red, or black. Wemoto list Hagon (made in UK) and Wirth (made in Germany) progressive fork springs, which are an upgrade of conventional springs. While conventional fork springs have the same spacing all the way down, progressive fork springs are wound tighter at one end – as the suspension is compressed the springs become stronger, for improved handling when the going gets rough without disturbing handling in normal conditions. Wemoto stock a choice of fork oils, from manufacturers Vision and Rock Oil and from 5W to 20W. 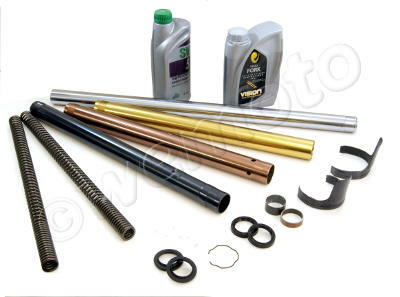 A lower or higher fork oil weight than standard can be used to soften or harden your front suspension.